The viola (in French, alto; in German Bratsche) is an alto string instrument played with a bow. Known as the "big fiddle," the viola serves as the middle voice because of its mid-range in the stringed instrument family, between the upper lines played by the violin and the lower lines played by the cello and double bass. The viola was formerly termed the "viola da braccio" in sixteenth century Italy and the viola may have appeared historically before the smaller violin. The casual observer may mistake the viola for the violin because of their similarity in size, closeness in pitch range (a mere perfect fifth separates the two), and identical playing position (both rest on the left shoulder). However, the viola's 'timbre' sets it apart: its rich sonority is more full-bodied than the violin's, dark-toned and earthy. The viola's mellow voice is frequently used for playing 'inner harmonies', and it does not enjoy the wide solo repertoire or fame of the violin. Cecil Forsyth in his book "Orchestration" states that:"The viola has perhaps suffered the ups and downs of musical treatment more than any other stringed instrument. In the late sixteenth and early seventeenth centuries, it held much the same position in the orchestra that the first and second violins occupy today. The violin with its higher pitch and its more exquisite tone-color, was continually 'knocking at the door', and the viola found itself servant where once it had been master." The viola is similar in material and construction to the violin but is larger in size and more variable in its proportions. On average, the "full size" viola's body length is between one and four inches greater than the body of the full size violin. Viola sizes are measured in inches or in centimeters, with an average size of about 16 inches. (Small violas made for children typically reach down to 12 inches, which is equivalent to a "half size" violin). Unlike the violin, the viola does not have a standard "full size." Acoustically the body of a viola would need to measure around 21 inches to match the acoustics of a violin. This large size would make it impractical to play in the same manner as the violin. 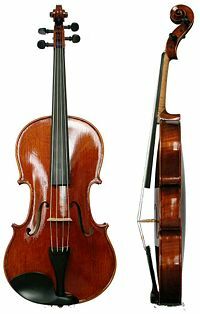 For centuries violists have experimented with the size and shape of the viola, with viola makers often compensating by tweaking the proportions or shape of the instrument in order to make a viola with a shorter string length and lighter weight which still has a large enough 'sound box' to create the unmistakable "viola sound." In the beginning, notable experiments with the size of the viola tended to address the instrument's sound by making it larger. These include Hermann Ritter's viola alta, an instrument measuring about 18.9 inches intended for use in Richard Wagner's operas. The 'Lionel Tertis' model viola, which has wider bouts and deeper ribs to promote a better viola tone, is another slightly 'non-standard' shape which allows the player to use a larger instrument than normal. Many experiments with the acoustics of a viola, particularly increasing the size of the body, result in a much deeper tone of the instrument, making the instrument resemble the tone of a cello. Since many composers wrote for a more traditional sized viola, changes in the tone of a viola, particularly in orchestral music, can have unintended consequences on the balance in ensembles. More recent (and more radically shaped) innovations address the ergonomic problems of playing the viola by making it shorter and lighter while finding ways to keep the traditional sound. These include Otto Erdesz 'cutaway' viola (which has one shoulder cut out to make shifting easier); the "Oak Leaf" viola (which has two "extra" bouts); 'viol' shaped violas such as Joseph Curtin's "Evia" model (which also utilizes a movable neck and maple veneered carbon fiber back reduce weight); violas played as if they were cellos (see vertical viola); and the quite eye-catching Salvador Dalí-like shapes of both Bernard Sabatier's violas in fractional sizes (which appear to have melted) and of David Rivinus' "Pellegrina" model violas (see Viola: External links). Other experiments besides those dealing with the 'ergonomics vs. sound' problem have appeared. American composer Harry Partch fitted a viola with a cello neck to allow intonation with his 43-tone scale. Recently, several luthiers created five-stringed violas, which allow a greater playing range. Modern music is played on these instruments, but viol music can be played as well. Playing the viola. This is a 17" viola. 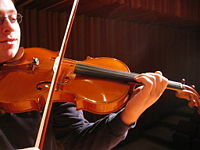 While it may appear to be similar to the violin's, the technique required for playing viola has many important differences. The most notable of these spring from the size of the viola, making it more physically demanding to play than the smaller, lighter violin. (There is anecdotal evidence that violinists who play the viola for a few months or more return to the violin as improved players). When a player switches from violin to viola (or vice versa), the viola will generally have a larger body as well as a longer string length. The most immediately noticeable accommodations a player has to make are to use wider-spaced fingerings, a wider and more intense 'vibrato' in the left hand, and to place the bow and right arm farther away from the player's body. The player must also bring the left elbow farther forward or around, so as to reach the lowest string. This allows the fingers to be firm and create a clearer tone. The viola is usually strung with thicker strings than the violin. This, combined with its larger size and lower pitch range, results in a tone which is more mellow and deep. However, a thicker string gauge also means that the viola "speaks" more slowly than its soprano cousin. Practically speaking, if a violist and violinist are playing together, the violist must begin moving the bow a fraction of a second sooner than the violinist does to produce a sound that starts at the same moment as the violinist's sound. The thicker strings also mean that more weight must be applied to the strings in order to play. The viola bow is slightly longer than that of the violin, with a wider band of horse-hair, particularly noticeable near the 'frog' (or 'heel' in the UK). Viola bows (70 to 74 g) are heavier than violin bows (58 to 61 g). Bowing technique differs from violin bowing in that more weight must be applied to pull sound from the strings. See also: [Playing the violin]. With some exceptions, including the specific string tunings, most the techniques outlined in that section apply equally to the viola. The viola's four strings are tuned in fifths: the C an octave below middle C is the lowest, with G, D, and A above it. This tuning is exactly one fifth below the violin, so that they have three strings in common—G, D, and A—and is one octave above the cello. Although the violin and viola have 3 strings tuned the same, the tone quality or sound color is rather different, although some musicians and non players may find it difficult to tell the difference. Violas are tuned by turning the tuning pegs near the scroll, around which the strings are wrapped. Tightening the string will raise the note (make it sharper) while loosening the string will lower the note (making it flatter). The A string is tuned first, typically to 440 hertz (see pitch). The other strings are then tuned to it in intervals of perfect fifths, bowing two strings simultaneously, or using a tuner, or the method often used in symphony orchestras: comparing the sound to instruments/violas that have been tuned (a piano can also be used). Most violas also have adjusters (also called fine tuners) that are used to make finer changes. These permit the tension of the string to be adjusted by rotating a small knob at the opposite end of the string, at the 'tailpiece'. Such tuning is generally easier to learn than using the pegs, and adjusters are usually recommended for younger players, although they are usually used in conjunction with one another. Adjusters work best, and are most useful, on higher tension metal strings. It is common to use one on the A-string even if the others are not equipped with them. The picture on the right shows normal stringing of the pegs. Some violists reverse the stringing of the C and G pegs, so the thicker C string does not turn so severe an angle over the 'nut', although this is uncommon. Small, temporary tuning adjustments can also be made by stretching a string with the hand. A string may be flattened by pulling it above the fingerboard, or sharpened by pressing the part of the string in the pegbox. These techniques may be useful in performance, reducing the ill effects of an out-of-tune string until the arrival of a rest or other opportunity to tune properly. The tuning C-G-D-A is used for the great majority of all viola music. However, other tunings are occasionally employed both in European classical music (where the technique is known as scordatura) and in some folk music styles. Mozart, in his Sinfonia Concertante for Violin, Viola, and Orchestra, which is in E flat, wrote the viola part in D major and specified that the viola strings were to be raised in pitch by a semitone; his intention was probably to give the viola a brighter tone to avoid its being overpowered by the rest of the ensemble. Lionel Tertis, in his transcription of the Elgar cello concerto, wrote the slow movement with the C string tuned down to B flat, enabling the viola to play one passage an octave lower. Occasionally the C string may also be tuned up to D.
Historically, the viola was used less often for solo concerti and sonatas than the violin and the cello. This was often attributed to its sound, which, being mellower and perhaps less sharp than that of the violin, was said to be less suited to virtuoso display. Sheet music written for the viola differs from that of other instruments in that it primarily uses 'alto clef', which is otherwise rarely seen. 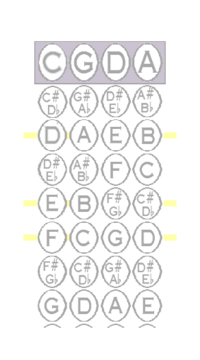 Viola sheet music also employs the treble clef when there are substantial sections of the music written in higher registers. In early orchestral music, the viola part was frequently limited to the filling in of harmonies with little melodic material assigned to it. When the viola was given melodic parts in music of that era, it was often duplication in unison or octaves of whatever other strings played. A notable exception would be J.S. Bach's Brandenburg Concerto No. 6, which placed the two violas in the primary melodic role (it was scored for 2 violas, cello, 2 violas de gamba, and continuo). A rare example of a piece written before the 20th century which features a solo viola part is Hector Berlioz's Harold in Italy, though there are also a few Baroque and Classical era concerti, such as those by Georg Telemann (one of the earliest viola concertos known) and Carl Stamitz. The viola plays an important role in chamber music. Wolfgang Amadeus Mozart succeeded in liberating the viola somewhat when he wrote his six string quintets, which are widely considered to include some of his greatest works. The quintets use two violas, which frees the instrument (especially the first viola) for solo passages and increases the variety and richness of the ensemble. From his earliest works Johannes Brahms wrote music that features the viola prominently. His first published piece of chamber music, the sextet for strings Opus 18 contains what amounts to a solo part for the first viola. Late in life he wrote two greatly admired sonatas for viola and piano, his Opus 120 (1894); these Brahms transcribed from the originals for the clarinet. Brahms also wrote Two Songs for Alto with Viola and Piano (Zwei Gesänge für eine Altstimme mit Bratsche und Pianoforte), Opus 91, "Gestillte Sehnsucht" or "Satisfied Longing" and "Geistliches Wiegenlied" or "Spiritual Lullaby," which was a present for the famous violinist Joseph Joachim and his wife, Amalie. Antonín Dvořák played the viola, and apparently said it was his favorite instrument; his chamber music is rich with important parts for the viola. Another Czech composer, Bedřich Smetana, included a significant viola part in his quartet "String Quartet No. 1 From My Life"; the quartet begins with an impassioned statement by the viola. The viola has also occasionally had a major role in orchestral music. An example of this is in the sixth variation of the Enigma Variations by Edward Elgar, called "Ysobel." While the viola repertoire is quite large, the amount written by well-known pre-twentieth century composers is relatively small. Violists may therefore be forced to choose to play arrangements of works originally written for the violin, cello or other instruments. Many solo viola pieces are transcribed from other instruments. In the earlier part of the twentieth century, more composers began to write for the viola, encouraged by the emergence of specialised soloists such as Lionel Tertis. Englishmen Arthur Bliss, York Bowen, Benjamin Dale, and Ralph Vaughan Williams all wrote chamber and concert works for Tertis. William Walton and Béla Bartók both wrote well-known viola concertos. One of the few composers to write a substantial amount of music for the viola was Paul Hindemith, a violist himself, often playing the premiere. Debussy's Sonata for Flute, Viola and Harp has inspired a significant number of composers to also write for this combination. Elliot Carter writes well for the viola. His Elegy is one of many fine compositions employing the viola, subsequently transcribed for clarinet. Ernst Toch wrote an Impromptu (opus 90b) for solo viola. Rebecca Helferich Clarke was a twentieth century composer who also wrote extensively for the viola. Lionel Tertis records that Edward Elgar, whose Cello Concerto Tertis transcribed for viola, with the slow movement in scordatura), Alexander Glazunov (who wrote an Elegy, Opus 44, for viola and piano), and Maurice Ravel all promised concertos for viola, yet all three died before substantial work on them. In the latter part of the twentieth century a substantial repertoire has been produced for the viola with many composers writing viola concertos. The viola is sometimes used in contemporary popular music, mostly in the avant-garde. The influential group Velvet Underground famously used the viola, as do some modern groups such as the Defiance, Ohio band The Funetics and others. A new independent label pop band, The Funetics, use two violas and guitar for its instrumentation. Jazz music has also seen its share of violists, from those used in string sections in the early 1900s to a handful of quartets and soloists emerging in from the 1960s onward. It is quite unusual though, to use individual string instruments in contemporary popular music. It is usually the flute or rather the full orchestra appearing to be the favored choice, rather than a lone string player. The upper strings could be easily drowned out by the other instruments, especially if electric, or even by the singer. The viola is also an important accompaniment instrument in Hungarian and Romanian folk string band music, especially in Transylvania. Here the instrument usually has three strings tuned g - d' - a (note that the a is an octave lower than found on the classical instrument), and the bridge is flattened with the instrument usually playing triads in a strongly rhythmic manner. There are only a few well known viola virtuosi, perhaps because the bulk of virtuoso viola music was written in the twentieth century. Some of the better known violists from the twentieth century are William Primrose, Milton Preves, Lionel Tertis, Paul Hindemith, Joseph de Pasquale, Raphael Hillyer, Lillian Fuchs, Milton Katims, Cecil Aronowitz and Walter Trampler. More recent well-known violists include Pinchas Zukerman, Yuri Bashmet, Ilya Hoffman, Robert Vernon, Kim Kashkashian, Hong-Mei Xiao, Pinco Pallino, Atar Arad, Thomas Riebl, Garth Knox, Gerard Caussé, Michael Tree, Roberto Diaz, Wolfram Christ, Tabea Zimmermann, Nobuko Imai, Rivka Golani, Kate Musker, Paul Neubauer, Karen Dreyfus, Patricia McCarty]], Timothy Deighton, and, from the younger generation, Roland Glassl, Viacheslav Dinerchtein, Cathy Basrak, Paul Coletti, Lawrence Power, Jennifer Stumm, and Antoine Tamestit. Among the great composers, several preferred the viola to the violin when playing in ensembles, the most noted being J.S. Bach and Wolfgang Amadeus Mozart. Numerous other composers also chose to play the viola in ensembles, including Joseph Haydn, Ludwig van Beethoven, Franz Schubert, Felix Mendelssohn, Antonín Dvořák, Benjamin Britten, and Rebecca Helferich Clarke. Some lesser known violists include Dominique Bloink, Cordelia Brand, Kyle Albert and Brian O'Keefe. The term violist is not universally used in English; some players, generally British, prefer viola player, since the word 'violist' is used to mean 'player of the viol'. The viola sees limited use in popular music. It was sometimes part of popular dance orchestras in the period from about 1890 to 1930, and orchestrations of pop tunes from that era often had viola parts available. The viola largely disappeared from pop music at the start of the 'big band' era. With the Charlie Daniels Band, Charlie Daniels has played viola instead of violin for some of the fiddling Redneck Fiddlin' Man. John Cale, a classically trained violist, played the instrument to great effect (amplified and often distorted) on two The Velvet Underground albums, The Velvet Underground and Nico and White Light/White Heat. John Cale also played viola on We Will Fall track on the debut Stooges album which he also produced. The band Kansas song Dust in the Wind, as well as on other tracks, features a viola melody. Robby Steinhardt plays violin, viola, and cello on the song and at least one of these on every Kansas song during his membership. Dave Swarbrick of the British Folk-Rock group Fairport Convention contributed viola music among other stringed instruments to the band, most notably on the Liege & Lief album on the track Medley... where he plays violin with an overdubbed viola playing the same part, but an octave lower. The viola has made a slight comeback in modern pop music; aided by string groups, Bond and Wild. In her latest album, Lonely Runs Both Ways, Alison Krauss uses the viola in many of her songs. However, not many "traditional" instruments are used in contemporary music at all. Vienna Teng, a folk/indie artist, used the viola as a solo instrument in two of her songs from her recent album Dreaming Through the Noise (2006). Although not as commonly used as the violin in folk music, the viola is nevertheless used by many folk musicians across the world. Extensive research into the historical and current use of the viola in folk music has been carried out by Dr. Lindsay Aitkenhead. Players in this genre include Cath James, David Lasserson, Eliza Carthy, Ben Ivitsky, Gina LeFaux, Helen Bell, Jayne Coyle, Jim O'Neill, Jim Wainwright, Lindsay Aitkenhead, Mark Emerson, Miranda Rutter, Nancy Kerr, Pete Cooper and Susan Heeley. An electric viola will usually have the same dimensions as a violin, which makes it hard to differentiate between an electric violin and an electric viola without hearing the open strings. The smaller size is easier to handle, and size matters less in terms of sound amplification and tone quality. On an acoustic/electric viola the common issues of a weak C string sound can be avoided Musical Electronics, Musik Lab. Retrieved May 23, 2008.</ref> even on a half-size viola, having the same size as a 4/4 violin. Electric instruments having five, six, or even seven strings, with the highest string being an E, are often called violins. Instruments may be built with an internal preamplifier, or may put out the unbuffered transducer signal. While such raw signals may be introduced directly into an instrument amplifier or mixing board, they often benefit from an external equalizer on the end of a short cable, before being "fed" into the sound system. All links retrieved January 22, 2016. "The Viola & Violists" – David Dalton, Primrose International Viola Archive. "Primrose International Viola Archive" – Brigham Young University Library. "Everything you always wanted to know about the viola and never dared to ask" – Viola-in-music.com. This page was last modified on 22 January 2016, at 16:53.